ahhhh, the pinkredgreyblack quilt is done! man, i wish photographing quilts wasn't so hard, they never look as nice as they do in real life. the colours in the above pic aren't quite spot on but the ones below are pretty close (on my monitor, anyway). now, on to the binding. i love this binding. i love the fabric i picked out for it at amitie and the fact that my machine binding is coming out pretty much perfectly after so much practice. i actually enjoy binding these quilts. i know that the quilting purists out there are shuddering with horror that i don't sew my bindings by hand but i've always been one to do things my own way, especially if it's easier, faster and looks nice and tidy, as my machine binding does. i'm a terribly slow hand sewer and these quilts take me quite long enough as it is, thank you very much. anyway, i get heaps of comments and questions about my machine binding and had every intention of doing a tutorial to walk you through it. i started taking pictures of the steps as i did this quilt then realised it would be easier and better explained if i just point you in the direction of the two tutorials i used to learn myself. amy karol of angry chicken has done a much better and more entertaining tutorial of machine binding than i could ever do (she uses bias binding and i use straight binding but the technique is the same) and fi of dearfii's explanation of creating mitered corners is pretty much perfection. using these tutorials together is how i learned to bind my quilts on my machine and there is no point trying to improve on something that is already done damn well. so check them out and try it for yourself and let me know how it goes for you. good luck! This is gorgeous Leslie. Love it so much and the back is just perfection. I too love the fabric you have used in the binding. I'm using it in my next two ranges. It's one of those versatile fabrics that seems to go with so many others. I think I'll bind a few bunny rugs in it myself. The quilt looks fanttastic. I love the colours that you used. The backing also goes just perfect!I love the effect of the stripes being crossed by the quilting. Awesome quilt, Leslie. And thanks also for your welcome honesty about the binding! I'm just getting into quilting, and the thought of hand sewing binding makes me shudder. 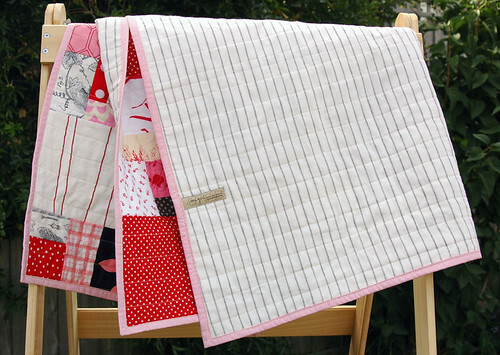 As you say, it's the end product that matters, and your quilts always look stunning. thanks for the links. i need to tackle this quilt top that's just sitting here while my baby gets chubbier and chubbier. what's your advice for machine quilting? do you use a walking foot? what's the best way to get it all through the machine? do you pin the layers together first? i love the colors of this quilt. it's a real sweetie. Stunning quilt Leslie! I really do love those colours and I think you have done a fabulous job photographing it too. Thanks also for the links - hadn't come across those ones before. I agree, if it's not broke don't fix it! I hope I can learn to do such straight machine binding one day! It's beautiful Leslie! Thanks for the tutorials will have to check them out. Oh my, I am speechless and wishing to wrap myself into it. So far I always machine sew the binding on. Much faster. And, the backing is perfect! thanks for the sweet comments, everybody! Leslie, this quilt is sooo lovely! Is my first time visiting here and i love your bubble space! Hop eyour having a lovely merry happy day and lots of love to you and yours! oh, this quilt is to die for! here's hoping my 2nd will be a girl so i can have one like that. we're really looking forward to having a 2nd (eventually), but i realised with the pregnancy and the breastfeeding, my body won't be mine again until early 2012! that's what scares me! I think you do better the 2nd time, as it's not all new, and there's less surprises. and an older sibling to help out too! This quilt is gorgeous!! The binding fabric is the icing on the cake! That's a gorgeous quilt!! Thanks for pointing to those tutorials....I get so annoyed with myself when doing binding. 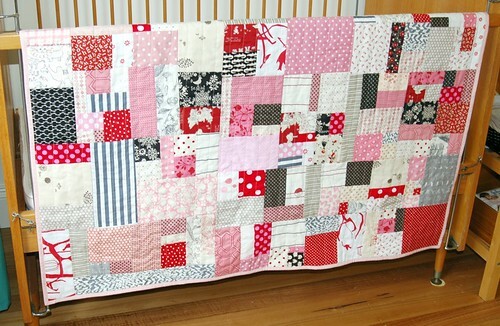 Beautiful quilt - I love the colors... especially the pink/red and cream/white combos. Lovely! So beautiful. I have starred this post so I can find it easily for future reference. 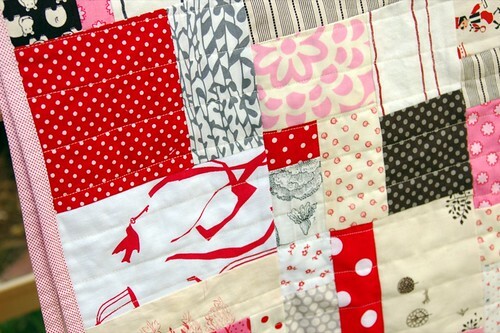 Patchwork and quilting is an idea in my mind that is coming closer to flowering everyday. But first I have to buy a new sewing machine. What a really pretty quilt- just so nice....well done and inspiring! This is possibly the most beautiful quilt I've ever seen. Absolutely perfect. 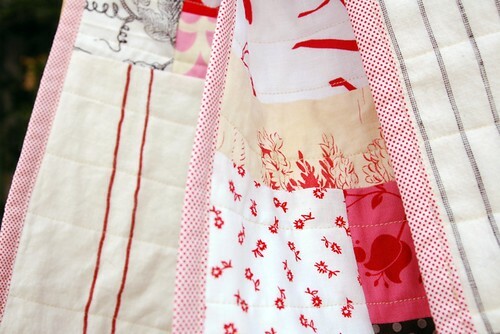 beautiful quilt binding,i love the colors,so cool,so inspiring, Love this blog.